A lot, but if really want me to chose, it will be Colours of the Wind. Do you hold hands when you walk in public? Close your eyes for a moment, who pops into your head? Do you say "I love you" in the relationship? I had no chance so far since I never had a relationship. Hmmm, besides where Danson Tang lives? HAHAX!!! My special yummy instant noodles with loads of ingredients. A very touching story or show. If you could time travel to the past to correct any mistakes you feel you’ve made would you? Nope, mistakes are made as a lesson, no point correcting them. Just make sure I don’t repeat my mistakes. Are you an outdoor or an indoor person? Travel around the world and leave my mark there. What 3 words would your best friend use to describe you? Do you have any tattoos, and if so what and where? When do you plan on getting married? I used to say that I would want to married by the age of 25 but then wait till I met someone willing to marry me first. Maybe I will end up staying single my whole life. Hahax. Get the number or give the number? Eh... Get the number? So I can do prank calls. LOL. Duh, romance of course. I am not a pervert. US size 8.But it depends though. Would you rather be hot or cold? 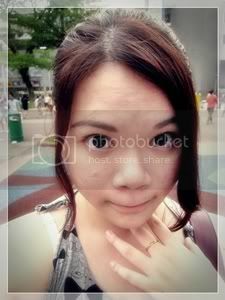 Anything, but maybe not opera... Preferably Danson Tang’s concert! Hehe!!! Eh, I dun go for brands. As long as nice and comfy and affordable can le. 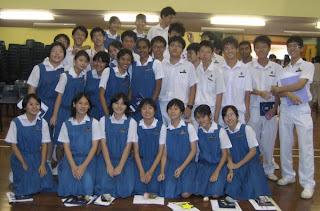 Secondary school, especially the time I spent in NPCC. Primary 3 when I was selected to represent the class for a storytelling competition, I could actually remember the contents but when I go on stage, my mind went blank and I keep stumbling. It’s super embarrassing la, so many ppl in the hall. If you had to pick one car, which would it be? Ermm, I am not into cars hence no idea. It’s not like I am able to afford any either. Pocahontas XD I simply love this movie. I still have the LD, mind you is a LD, Laser Disc, those big big disc. Finally found time to watch NANA2. The new shin was good, look more like shin. Actually i quite like the new ren, not bad. I shall find time to finish watching the 50 episodes of NANA the anime. While waiting for chapter 69 to be uploaded. Probably even scared to see how this quiz came out! You are the epitome of a natural beauty. Your look is definitely effortless. And while you shy away from a lot of make-up and accessories, you're no granola girl either! You tend to like to make calculated risks. You are up for whatever's new and (a little) exciting! Like most people, you find it a little difficult to stay at at weight you're comfortable with. If you change a few habits and make food less important, you may find the struggle hardly exists anymore. You may not be a CEO yet, but you're well on your way to success. You take your career seriously, and you wouldn't stop working for any guy! An independent woman, you pay for your own car, clothes, and housing. And men appreciate that - at least, the ones as driven as you are. You are spiritual, intuitive, and serene. People trust you to rescue them from bad situations, and you usually come through. While you are quite enlightened, you find that your path is very lonely. What Color Is Your Psyche? You're practical, thrifty, and able to do almost anything. Appearances and trends aren't important to you. You just like to get the job done. You may watch someone from afar before you finally decide to make your move. It takes a long time for you to develop an attraction to someone. Generally, you prefer to pick who you love. Anyone who tries to rush you is in for some heartache. You are most compatible with people born on the 2nd, 11th, 20th, and 29th of the month. You are almost like a life coach for your best friends. You give them help when they need it... but you also know when to give them a push. People tend to rely on you for moral support and advice. You've probably always been mature for your age, so this is a role that's you're comfortable with. A friend like you is one of the rarest kinds. You are both a good mentor and companion. Your friendship quote: "The only way to have a friend is to be one." What this color says about you: "I'm creative and know how to take care of myself"
You are a very peaceful person. All is good in your world, no matter what's going on. Occasionally you let your problems get to you, but you generally remain upbeat. Your inner strength is inspirational - much more so than you may realize. You really, truly want to change. You're just not sure that you can do it. Think about times you've made hard changes, and what you did to get through them. A change is in your future - you just need a little help getting started. Might not be online tmr, cause no electricity due to some wiring work. On good friday, i went out with HL and BY to watch rule#1 at plaza sing. What's scary is the piece of paper saying that 'if you dare to touch her and she might follow you home' or something close la. Ok, now about the movie.It's more of gory then scary la. There's only one scary part about the movie and it's where the ghost sit up from the car boot and kind of claw at her wound at the neck. The rest is more of gore. But then the sound effects not bad though, it nearly scare the hell out of me.LOL. Anyway, the whole movie is about how ghost can possess people and when they left, the person will be left without a soul, just the body left. If i were to rate it, i will give it 3 stars, mainly because of the good sound effects. Haha, enough abt the movie. After the movie, the three of us jus hang around, walking aimlessly and chatting. oh yar about my results. It's like the same as last semester...Not much difference. I am very free these days. So i have alot of time to do anything. I got alot of brain cells to spare. Or maybe i should say that chinese is my forte so if i were to think of anything about chinese, no need to use brain cells at all. So even if ppl think i am wasting my time, effort or anything, don't need to worry at all. I have got alot of time and effort to spare and waste. 3. Use the song title as the answer to the question even if it doesn’t make sense. No cheating. 4. With the answers, give your own comments on how it relates to the questions. ermm, i looking for an angel to come save me??LOL!!! Wa, i will live for a million yrs!!LOL!!! they know what's happening all the time.hehex. wat? 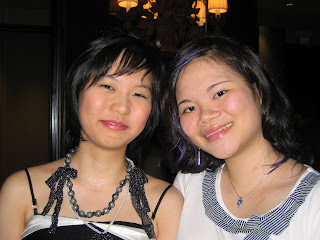 i am a small big shot in high sch??LOL. or is i sheng cang bu luo.KEKE. By trying to probe into other's love life??HAHAX!! !can go open marriage agency.LOL. What is the best thing of your friends? What’s in store for this weekend? Wat? Am i going to be in love??LOL!!! Ermm, telling me to runaway from this cruel world and never return? If only i have a pair of eyes that laugh??? I think that they lust after trees instead ba..HAHA!! How can you make yourself happy? Ermm, maybe a girl??? HAHA! Maybe not. What song would you strip to? LOL, maybe only if there's winter in S'pore. What does your mum think of you? Ermm, she think i am useless at the beginning??? What is your deep, dark secret? hmmm, i forget how to love?? HAHA!Did i even love anyone in the first place?? What is your mortal enemy’s theme song? Eh，my enemy like to 勾引 people??? Imagining things all the time?? Abit true.HAHA!! !The only answer that make sense..LOL. What song will be played at your wedding? Hmmm, maybe my wedding will be a colorful one??? LOLX!!! haha, i jus random pick any 5. hehe. Just watched Sky Of Love today. It's a very nice and touching movie. I actually cried towards the end of the movie. Even though some parts of the movie is expected like you can guess what happen next easily, but still it's nice. Those who like to watch simple love stories should watch this movie. I strongly recommend this movie!!! So the IT show has ended. Been working for like 10 hours everyday for these four days. Leg pain, shoulder pain, back pain. It's been a while since i have to stand for long hours, that's why everywhere also pain. Hahax!!! Sold twenty over sets over these four days. Not bad la, since i am like first time working in IT show. Hahax!! Actually, i felt like going shopping. The booth beside us, the A1 computer station is selling 4GB thumbdrive for only $28!!!!! It's like so frigging cheap la! Never, at least i work i earn money. Hehex! If i shop, i spend money. So thinking back, it's good that i don't get to shop as i knew very well i will splurge as the things there are very cheap. LOL!! Okie, shall post till here today. Going to work at the IT fair from tomorrow onwards all the way to sunday. Selling ink for sepoms. Located at level 6. Want to buy ink for printer come find me. Hahax. Ok, shall end here. Nothing much to blog about too. Hahax. Suddenly felt like dedicating a post to my past memories. LOL. And this is the 150th post of my blog although it's not accurate as I have deleted alot of non-important posts of the past. Hahax! 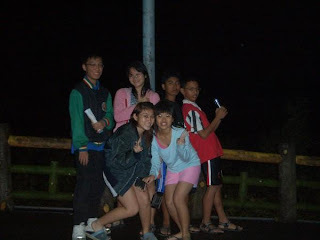 This photo is taken during NPCC Taiwan trip in 2005. We were in a countryside area named pingsi and i remembered that we took this photo before we went to play those sparklers. Oh yar, it's also taken outside a local police post. And there's a very cute little policemen statue near the door of the police post.Hehe. 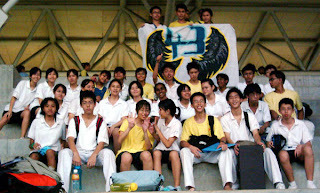 This is taken during Racial Harmony 2006 by Mr Lim. 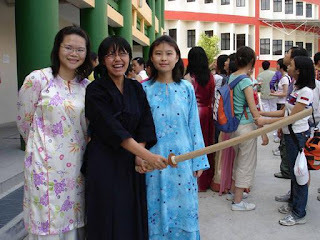 Hehe, my sec 1&3 maths teacher. A very nice teacher. And that's me at the very left, Sarah in her kendo suit in the center and Sortie and the right. And i knew that this very photo is placed outside the corridor near the cca rooms. LOL. This is taken after campcraft competition 2006. Of course it's the girls team. Haha, although we din win or anything but we raised the flag!!! The boys did not. LOL. And that guy in the photo, is Ashari who's so extra to join in the girls for photo taking. Hahax. 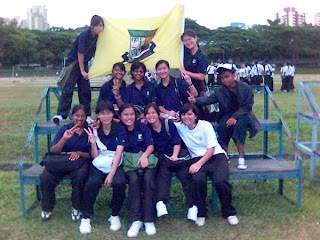 This is taken after POP 2006 with my juniors. 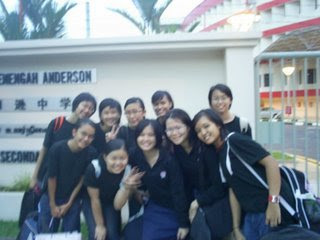 They are the sec2 girls squad, a bunch of very nice girls. I am the second one from the right in the first row. The one on my left is BY, my fellow squadmate. The juniors gave each of us a very special card which i still kept now. The second is taken with BY. My Kbox khaki, LOL. 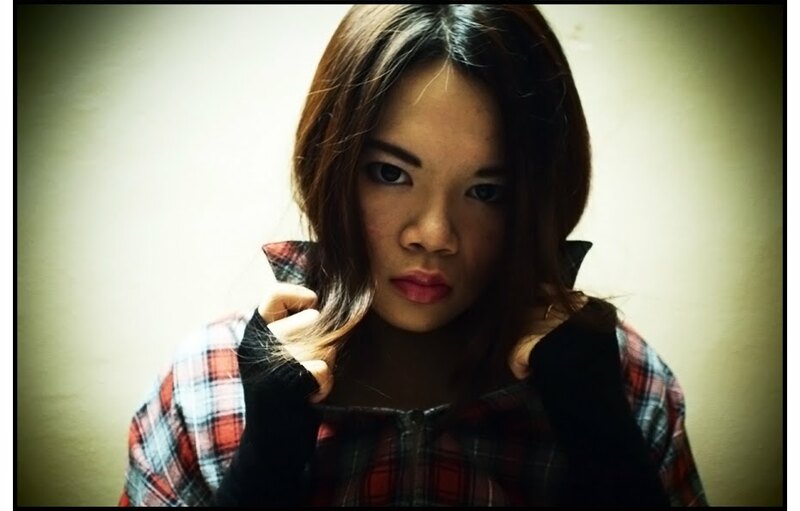 I only go Kbox with certain people, cause i shy LOL, only sing in front of close friends.Hehe. 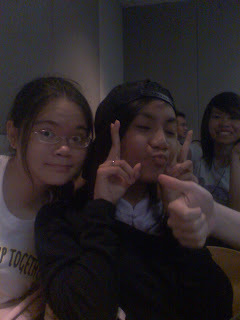 This is taken during lecture with dear ana with ida in the background. Actually wanted to post more photos of MS0702, but then i realised that most of the pictures are on my bro's desktop which just broke down like yesterday. Forget to transfer to my laptop... Hence, alot of photos gone. Well, i just walked down a certain part of my memory lane.